This post is the third in a series about myths surrounding the origins of yoga. You can read Part I here on yoga in Ancient Egypt, and Part II here on the 5,000-year-old yoga myth. I ended the last post in this series with the revelation that postural yoga as it is practiced today is not 2,500 years old, let alone 5,000 years old as many claim. But this raises the question, exactly how old is postural yoga? Where exactly do all these poses come from, and how did yoga become synonymous with acrobatic, physical practice? To understand the answer to these questions, it’s necessary to review a bit of history. The traditional practice of yoga most closely aligned with modern postural forms was hatha yoga, which flourished in India from the 13th century until its decline in the 18th. However, to say traditional hatha yoga and yoga today are the same is impossible. Historical texts in the hatha tradition do describe several asanas, however, there are relatively few included and, similar to the texts discussed in my last post, the focus is on seated postures rather than the more acrobatic, gymnast standing or inverted postures common now. Other bodily practices that were part of traditional hatha yoga might be downright alarming to yogis today. These included: “(1) dhauti, or the cleansing of the stomach by means of swallowing a long, narrow strip of cloth; (2) basti, or ‘yoga enema’ effected by sucking water into the colon by means of an abdominal vacuum technique (uddiana bandha); (3) neti, or the cleaning of the nasal passages with water and/or cloth; and (4) trataka, or staring at a small mark or candle until the eyes water” (Singleton 2010:28). 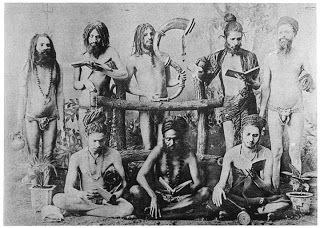 When British rule in India began in 1773, hatha yogis were actually viewed negatively by both Westerners and Indians. Hatha yogis were associated with black magic, perverse sexuality (based in tantric philosophy), abject poverty, eccentric austerities, and disreputable, sometimes-violent behavior. This wasn’t simply prejudice, either. From the fifteenth century until the nineteenth century, highly organized bands of militarized yogis roamed Northern India, controlling trade routes and becoming so powerful that they were able to challenge the East India Company and British rule (39). The British government went so far as to ban wandering yogis and tried to promote more “acceptable” religious practices among Indians, namely meditative Hinduism common among the educated and upper classes. These policies were supported by wealthier Indians who hoped for reconciliation with British rule and found traditional hatha yogis disturbing at best. As the scope of colonial police powers grew in India, poor hatha yogis were increasingly demilitarized and forced to settle in urban areas where they often resorted to postural yogic showmanship and spectacle to earn money panhandling. As a result, physical hatha yoga practices became associated with the homeless and poor, and were considered by both the British and Indians “not only inferior but parasitic on other, worthier expressions of yoga” that foregrounded meditative traditions (43). In the late 18th and early 19th century, the British began to pursue policies of conciliation towards the native culture of India. As a result of this policy, many Indian and European administrators, intellectuals, and public officials began supporting the creation of a new, modern India that combined the best of what modernity and the West had to offer, but in a traditional, Indian form. Years of colonial rule had resulted in numerous stereotypes of Indian effeminacy and degeneracy narratives that implied Indians were physically and racially degraded–in other words, inferior to whites. Re-appropriating hatha yoga became part of a larger project of Indian nation building and the construction of the new Indian man designed to combat these stereotypes. At the time fitness and exercise regimes known as “physical culture” were quite popular in the West and, as a result of colonial influence, in India. 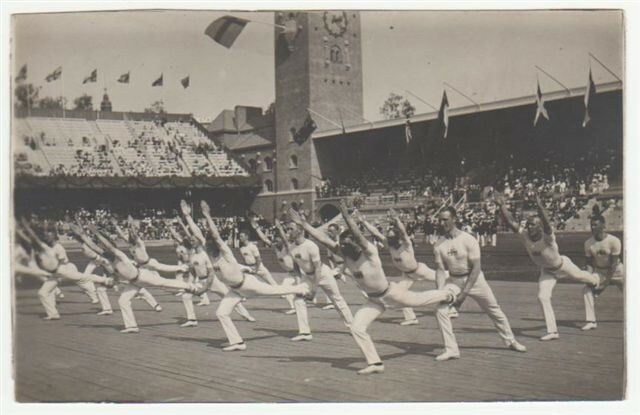 Physical culture was based in body building practices, gymnastics (which at this point in history was male-dominated), and military calisthenics. Because of it’s emphasis on manliness and cultivating the body it was generally viewed as a way to regenerate moral and physical mettle of India and its people (read: men). Traditional hatha yoga practices were re-appropriated and combined with modern physical culture in an attempt to meld “indigenous” Indian exercises with more Western practices and ideals. Thus, a new, more aerobic and acrobatic version of yoga was born that was devoid of any of the negative associations of earlier centuries. This new, reinvented form of yoga had more in common with body building, gymnastics, and military calisthenics than traditional yoga practices. But because it was combined with a few “acceptable” hatha yoga practices, and had the label “yoga” attached, it was seen as part of the cultural heritage of India and used to promote a new image of the modern, strong, and masculine Indian body as well as a modern, independent India. As such, modern postural yoga was created in direct opposition to the project and discourses of colonial empire, and cannot be separated from Colonialism. This means that modern postural yoga, and most of the poses we practice today, are only around 100 years old. One of the most influential figures in the development of modern yoga, T. Krishnamacharya (1888-1989), was deeply embedded in physical culture. His financial backer, the maharajah of Mysore, was a physical culture enthusiast, and many of the teachers he was connected to or the students he would later teach came from similar fitness backgrounds. The result was a new formulation of yoga that was a marriage of body building, gymnastics, military calisthenics, and those hatha yoga practices that were deemed acceptable. It was this new form of yoga that was taught to some of the most influential global yoga teachers of the 20th century: B.K.S. Iyengar, K. Pattabhi Jois, Indra Devi, and T.K.V. Desikacha. It was this new physically-orientated, acrobatic form that would later migrate to the West, a yoga nearly devoid of any spiritual or meditative practice. Some of the poses or sequences we often think of as foundational to yoga today were only invented after 1930. 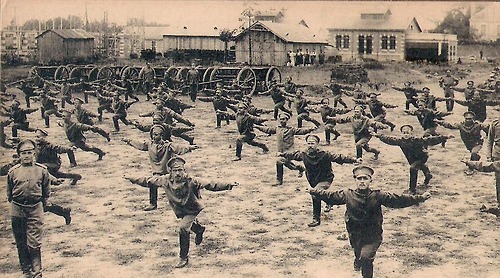 Sun salutations, one of the most venerated yoga sequences, were invented in the 1930s and have more in common with military calisthenics and gymnastics than with yoga. On top of that, many of the inversions or arm balances we see today have only appeared in the past few decades. Often the use of sanskrit for these poses is intentional to make them seem like part of a cultural tradition of yoga, that, let’s face it, doesn’t really exist in the way most yogis believe. The idea that the poses we practice are part of a thousand year old tradition is completely false; the idea that they are even hundreds of years old is a myth. So why do so many yogis believe in origin narratives of yoga that trace postural yoga to some ancient tradition? What purpose do these myths serve? And what are the implications of the true history of yoga for our practice? Does it mean modern yoga is “inauthentic?” I’ll explore these topics in my next post in this series! Where Yoga Poses Come From (by Alanna Kaivalya): This is one of my favorites, the author wrote an entire book about the mythical origins of yoga poses and only after publication realized that many of the poses she wrote about were less than 100 years old… talk about origin myths! Previous PostAre Commercial Deodorants Harming Your Health?Next PostYoga: Caught in the Glass Box? If we had enough evidence to actually argue that yoga originally came from Africa, I’d be fine supporting the idea. But the fact is there simply isn’t enough evidence to make that claim. A few pictures that look similar to poses (which, FYI, many poses didn’t exist and weren’t the focus of yoga until only the last 100 or so years) does not mean that yoga, as a philosophical and spiritual tradition that is diverse and very complex, originated in Africa. The human body can only move so many ways, and similar body practices to asana exist in many cultures. Does the fact that ballet shares some similar physical postures make it yoga? No. Is it possible yoga can be traced to Africa? I guess so. But as I said, there simply is not enough evidence to support this, and most arguments about it are focused primarily on asana practices, not yoga as a whole, which is problematic because asana has changed drastically in the last 150 years and become much more foregrounded than it ever was. The desire to make the claim that it’s possible to trace yoga back to Africa has more to do with current social circumstances and needs than it does actual historical research and archeological evidence. Culture is constantly shifting. But we can still trace cultural evolutions across time (given enough evidence). We can’t do this adequately in these cases, or the best we can do is trace how drastically they have changed because of processes like colonialization, imperialism, and capitalism. Exploring the constant state of becoming.